Nolan McCready | Littler Mendelson P.C. Nolan McCready has experience defending and advising employers in a wide range of employment related matters and focuses his practice in the area of high-stakes workers’ compensation disputes, with an emphasis on representing sports team owners and management. 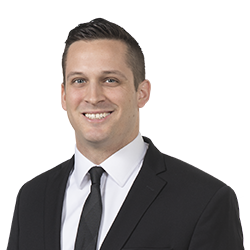 Nolan skillfully represents clients in all phases of workers’ compensation claims, including exhaustive deposition of claimants and expert witnesses and aggressive litigation at the administrative and appellate levels. He displays a wide-ranging knowledge of California’s nuanced laws when advising his clients, particularly in complaints filed by professional athletes without connections to the state. A three-year letterman in college, Nolan played defensive back for Penn State University’s football team. He understands the inner workings of athletics, giving him a distinctive advantage in providing strategy and guidance for his clients. Nolan’s experience also extends to the film industry, where he advises on legal production deliverables, such as distribution and co-financing agreements, and the preservation and maintenance of employment-related documents. In fact, he served as a legal project manager for a client’s widely disseminated animation movie and his name was listed among the credits. While in law school, Nolan served as production counsel for a variety of limited-budget motion pictures. He drafted incorporation documents, filed copyrights and prepared production-related contracts, among other responsibilities.